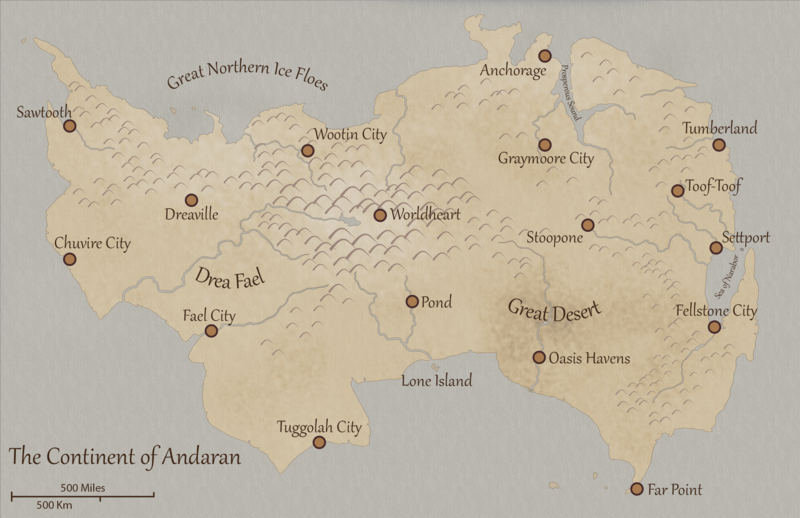 The continent of Andaran is a large continent on a world much like our Earth in many ways. It’s large, 2,800 miles (4,480 km) west-to-east and 1,930 miles (3,088 km) north-to-south. It was settled over two thousand years ago, but no one today knows where there original settlers came from. Over the centuries, many attempts were made to discover other land masses in the world, but to no avail. Most of those intrepid explorers never returned; the few who did returned empty-handed. Sawtooth, in the northwest: fishing, timber, and some mining. Anchorage, in the north: fishing, timber, furs, and rare hardwoods. Tumberland, in the northeast: extensive mining including rare earths, and some timber. Fellstone, in the southeast: an industrial area supported by Fellstone Bay and the Sea of Narabor, plus fishing and farming, especially grains. 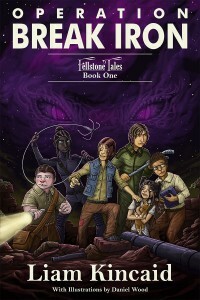 The Fellstone region includes the Great Desert. Pond Region, in the south: largely natural wetlands along the coast, with some farming, mostly rice, on what little higher ground there is, and a bit of industry along the Rutarri River. Pond Region includes Lone Island, a few dozen miles from Southport. Drea Fael, in the southwest: lush, green rolling hills and plains that support extensive farming, dairy, and ranching. There is a bit of timber in the highlands, and some industry along the western coast. Nestled in a beautiful valley high in the central mountains, is Worldheart City, once the seat of government over all Six Regions. Now it lies in ruins, abandoned, and uninhabited. An additional prominent feature is Andaran’s vast system of caves known as The Belowground. Located mostly in the central mountains, the natural caves have been extended and connected over the centuries by man-made tunnels to reach toward the regional capitals, making travel to and from Worldheart possible even in the severest weather.